Since 1986, Wheat Designs by Linda Bisnett has been actively producing wheat arrangements in a variety of styles. The company is located in picturesque Eastern Oregon at the base of the Blue Mountains, an area with a history of wheat production dating back to the 1870's. Rolling wheat fields carpet the landscape where nearly 80% of the state's wheat crop is grown. Climatic conditions and deep, rich soil are perfect for the growth of the dry land wheat. The wheat is used in food production world-wide. The wheat plant is perfect for our designs. Year after year, consistently high quality wheat is hand harvested for use in our wheat designs. The introduction of new varieties of wheat in this large wheat growing area gives our company a continual supply of new choices of wheat to incorporate in our designs. Wheat Designs by Linda Bisnett takes great pride in the creation of each design. Design selections include numerous styles of standing arrangements, wreaths, swags and wall hangings. The wheat utilized in the designs is locally grown and includes soft white spring wheat, soft white winter wheat and hard red spring wheat. Some of the designs contain special varieties grown by agronomists at the Columbia Basin Agriculture Research Center. Carefully, the wheat is hand harvested in July and early August; then it is stored in weather tight storage buildings. The wheat is hand sorted and cleaned prior to construction of the wheat design. Due to the durable nature of wheat, each design will last many years with little care. Whether ordering for yourself or as a gift, you are certain to be delighted with the natural beauty of a Wheat Design by Linda Bisnett! Linda Bisnett was an accredited flower show judge and exhibitor when she started designing dried wheat arrangements. Inspired by the golden fields of wheat surrounding her home, she has continually produced a wide variety of beautiful wheat arrangements since that date. Her studio and country home is located on the wheat ranch homesteaded by her great-great-grandfather in 1886, making her the fourth generation to live at the site of the original homestead. Linda has taken special care to incorporate farm land conservation and wildlife habitat enhancement practices to preserve the land and natural beauty of this century old farm. 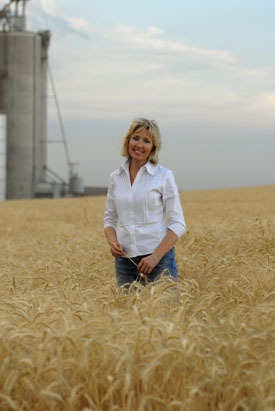 Linda is a member of the Oregon Wheat Growers League. She is also a Master Gardener and enjoys growing expansive flower, fruit and vegetable gardens around her home.